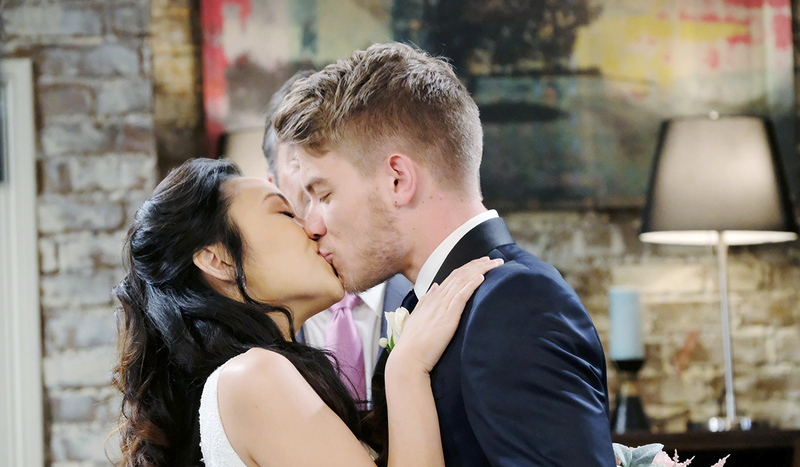 Monday April 15, 2019: On Days of our Lives today, Jack has stopped the wedding due to his sister, Adrienne, Claire fantasizes, and Ben and Ciara get intimate for the first time. 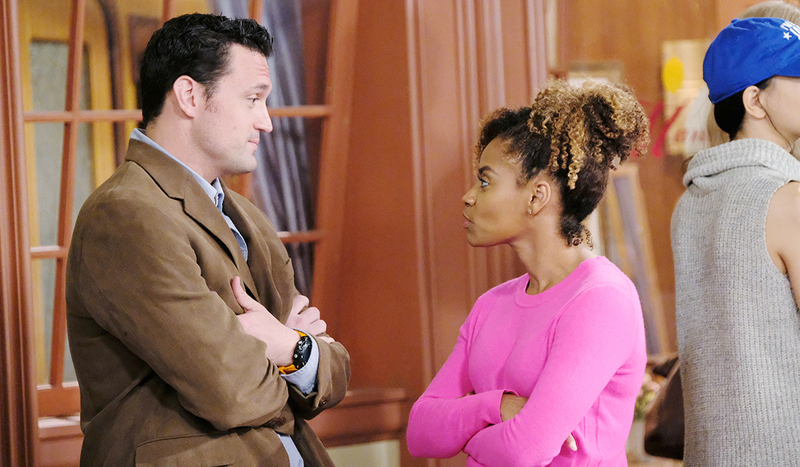 At the groundskeeper’s house, Ben asks Ciara to stay over. He offers the bed but she wants to sleep with him. She says she’s ready so Ben rips off his shirt and they kiss passionately. They head to the bed and pant into each other’s mouths until Stefan calls. Ben takes the call and has to rush off to see Stefan. Ciara waits for him. He returns momentarily and has to go out again. Stefan got a lead on the cartel men. Ciara asks him to be safe. She agrees to wait so he gives her a shirt to sleep in. At the loft, Agent Smith’s curious about Claire’s outburst at the wedding. 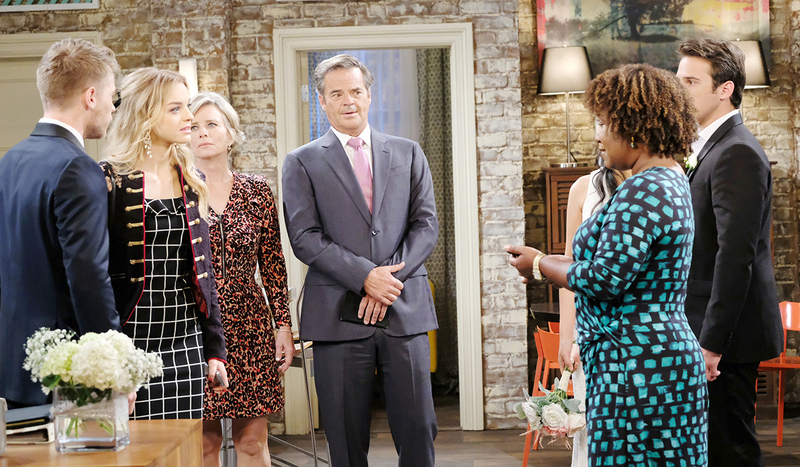 Claire plays the recording of Tripp calling his wedding to Haley a sham. Tripp seethes and confronts Claire. Agent Smith will be deporting Haley immediately. She thanks Claire who claims she’s doing her civic duty. She says they can visit Haley there. Smith interrupts. Tripp’s going straight to prison! Claire is shocked and doesn’t want that to happen. JJ tries to help and Tripp explains that immigrants are harmless. He never wants to see her again. Agent Smith calls Claire’s name a few times and knocks her out of her fantasy world. None of that happened. Claire says she’s there to watch the wedding. They allow it. Justin pronounces Haley and Tripp husband and wife. They smooch and JJ looks away. Kayla and Justin congratulate them and they pop the champagne and cut the cake. JJ goes to Claire and tries to reassure her that they’re doing the right thing. Agent Smith tells the bride and groom that they’re very convincing but ICE will be watching them. His wife will be deported immediately if they can prove it’s fake. Claire sips champagne in the corner as Justin toasts Tripp and Haley. Kayla offers support and she, Justin and JJ leave. Haley walks JJ out and Tripp asks the real reason she showed up tonight. Outside, JJ kisses Haley on the cheek for luck. Haley goes back inside and Claire leaves, devastated. At the square, Jack stops the wedding after staring at Jennifer. 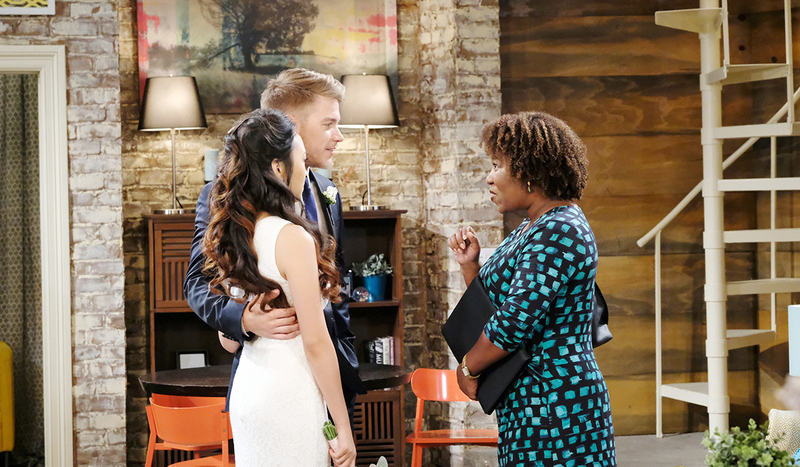 Eve encourages him to just say I do. He can’t because something is wrong. Adrienne tries to intervene and she thinks that his stumble is due to him not being in love with Eve. A voter, (played by Asha Kamali), watches and talks to some other man as the drama unfolds as Jack tells his sister that she’s not being supportive. He wants to see her officiant card again. Adrienne grumbles and hands it over. It’s expired. Jack starts carrying on and yelling that she stabbed him in the back. Adrienne claims she didn’t know but doesn’t want him to waste his life “with this horrible woman” because she loves him. They bicker and scream at one another until some random man appears and defends Jack. He asks how Adrienne can hurt his own brother like this. She yells that she’s trying to protect him. The man turns out to be a pastor, (played by Kevin Gardner), who offers to marry them. They cut to the I dos and are pronounced husband and wife. Jack kisses his bride and Jennifer looks down. Later, Eve drops by to gloat to Jennifer. Jack appears and apologizes. Jennifer wishes them a happy life together and goes to file her story. JJ meets Jenn at the pub. She’s working on her story. They commiserate over the ones they care for marrying others. JJ’s more concerned about his mother. He tries to comfort her. She has no fight left in her and decides to visit Abigail. Back at Salem Inn, Jack pours champagne and Eve admits she was worried Jennifer would stop the wedding. Jack calls Eve his future. He carries her to bed, saying he wants a real wedding night. Eve’s overcome with happiness. Brady isn’t happy with Victor’s decision.